Heat a wok over a medium heat until hot, add the toasted sesame oil and heat for about 30 seconds. Stir in garlic and black bean sauce, and season with salt. Add chicken to the wok; cook, stirring frequently, until chicken is cooked through. Pour in dissolved chicken bouillon, cover, and cook for 6 minutes. 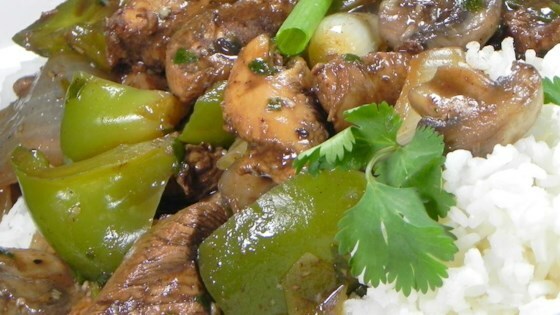 Stir in onion, green onions, and bell pepper, and season with soy sauce and black pepper. Cover, and cook for 8 minutes. Stir in cornstarch mixture, and stir until sauce thickens. Stir in cilantro, and serve.